/Affiliate Links and Marketing /What Is Coupon Code Commissioning? Commissioning your affiliates via coupon code is a fantastic new way for your affiliates to transparently market for you. Using this method, your affiliates can send customers DIRECTLY to your website without having to use an affiliate link or have the customer enter in their affiliate ID once they reach your website. The customer simply visits your website directly and enters the provided coupon code during checkout.. they receive an instant discount and the affiliate earns a commission! The first thing you need is iDevAffiliate 8 or higher and you’ll need a shopping cart system compatible with the coupon code commissioning feature. In order for this setup to work, the shopping cart system must be able to pass iDevAffiliate the coupon code used (by the customer) at the time of checkout. 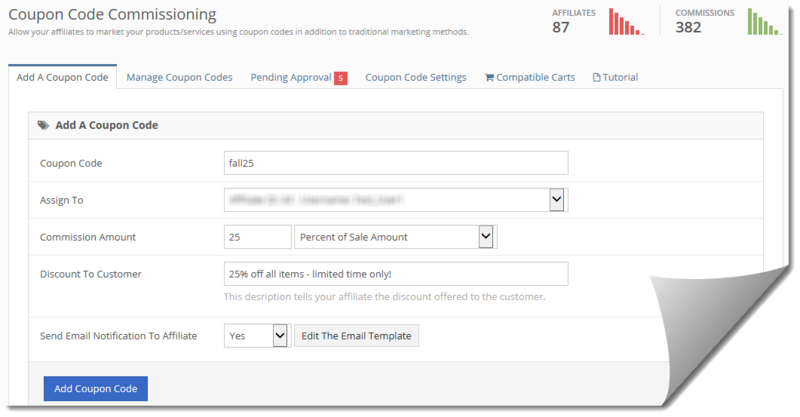 In your cart system, create yourself a coupon code just like you normally would. Let’s assume you’re creating a coupon code called fall25 which gives the customers a 25% discount at the time of checkout. Now login to your iDevAffiliate admin center and go to Commission Settings (menu at top) then Coupon Code Commissioning. On this page, enter in your coupon code (fall25) and assign the affiliate as well as the commission rate. That’s it! Now your affiliate can hand out that coupon code and send visitors DIRECTLY to your website to make their purchase. As the customer checks out, they enter the coupon code and enjoy the instant discount and the assigned affiliate automatically gets a commission just as if the customer had clicked an affiliate link prior to purchase.